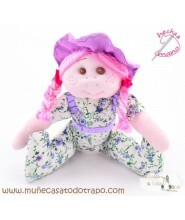 Soft, squishy and secure rag dolls designed by psychologists. My baby is afraid to turn off the lights of his room at night. I can not convince him to go to sleep, my baby cries every time she wakes up ... in our Siestina will find a solution, give your son or daughter the best doll for babies. Offert to your children only the best care.